FILE - Actor Tab Hunter arrives at the Hollywood Foreign Press Association Luncheon in Beverly Hills, California, Aug. 13, 2013. Actor and movie idol Tab Hunter, whose striking good looks attracted a huge following among teenage girls in the 1950s, has died at 86. Hunter's spouse said the actor died unexpectedly after a blood clot in his leg led to cardiac arrest. Hunter was born Arthur Kelm in New York and became interested in acting at an early age. In Hollywood, an agent renamed him Tab Hunter and got him minor movie roles, particularly in war drama and westerns, despite no formal dramatic training. 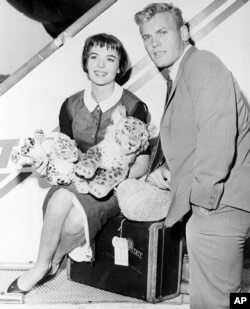 Actress Natalie Wood, left, and actor Tab Hunter pose at the TWA baggage claim at Idlewild Airport in New York City, after arriving from Los Angeles, Aug. 21, 1956. Hunter was cast as a baseball player in the 1958 musical "Damn Yankees." The role made him a household name. He also appeared on Broadway and starred in his own television situation comedy. Hunter won new fans in the 1980s when he was cast in the cult films "Polyester" and "Lust in the Dust." In his 2005 memoir, Hunter revealed he was gay. He wrote about his frustration in being forced to hide his true self in 1950s America. "I believed wholeheartedly — still do — that a person's happiness depends on being true to themselves," he wrote.